CHICAGO and PARSIPPANY, N.J., June 27, 2018 /PRNewswire/ -- Conagra Brands, Inc. (NYSE: CAG) and Pinnacle Foods Inc. (NYSE: PF) today announced that their boards of directors have unanimously approved a definitive agreement under which Conagra Brands will acquire all outstanding shares of Pinnacle Foods in a cash and stock transaction valued at approximately $10.9 billion, including Pinnacle Foods' outstanding net debt. Under the terms of the transaction, Pinnacle Foods shareholders will receive $43.11 per share in cash and 0.6494 shares of Conagra Brands common stock for each share of Pinnacle Foods held. The implied price of $68.00 per Pinnacle Foods share is based on the volume-weighted average price of Conagra Brands' stock for the five days ended June 21, 2018. The purchase price reflects an adjusted EBITDA multiple of 15.8x, based on Pinnacle Foods' estimated fiscal year 2018 results excluding synergies, and 12.1x adjusted EBITDA including run-rate cost synergies. The combination of two growing portfolios of iconic brands will serve as a catalyst to accelerate value creation for shareholders. The transaction will enhance Conagra Brands' multi-year transformation plan and expand its presence and capabilities in its most strategic categories, including frozen foods and snacks. 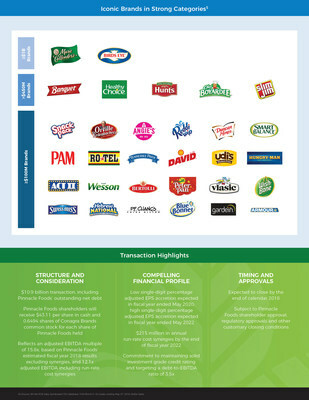 With annual net sales in excess of $3 billion, Pinnacle Foods' portfolio of frozen, refrigerated and shelf-stable products includes such well-known brands as Birds Eye, Duncan Hines, Earth Balance, EVOL, Erin's, Gardein, Glutino, Hawaiian Kettle Style Potato Chips, Hungry-Man, Log Cabin, Tim's Cascade Snacks, Udi's, Vlasic and Wish-Bone, among others. Based on both companies' latest fiscal year results, pro forma net sales would have been approximately $11 billion. "The acquisition of Pinnacle Foods is an exciting next step for Conagra Brands. After three years of transformative work to create a pure-play, branded food company, we are well-positioned to accelerate the next wave of change," said Sean Connolly, president and chief executive officer of Conagra Brands. "The addition of Pinnacle Foods' leading brands in the attractive frozen foods and snacks categories will create a tremendous opportunity for us to further leverage our proven innovation approach, brand-building capabilities, and deep customer relationships. With greater scale across leading, iconic brands, an unwavering focus on driving profitable growth, and a strong balance sheet and cash flow, we are creating a tremendous platform to drive meaningful shareholder value." "Today's transaction provides Pinnacle Foods shareholders with substantial and immediate value, as well as the opportunity to participate in the significant upside potential of the combined company," said Pinnacle Foods chief executive officer Mark Clouse. "Because of our employees' incredible work, Pinnacle's total shareholder return is approximately 275 percent since our IPO, and today marks an important milestone in the company's journey. The portfolios and capabilities of both enterprises are impressive and complementary. We look forward to working through a seamless transition with the Conagra Brands team." Complementary Portfolio of Iconic Brands: The combined company will have a portfolio of leading, iconic brands within attractive domains such as frozen & refrigerated meals and snacks & sweet treats. Enhanced Ability to Capitalize on Trends in Frozen Foods: The combination will bring together complementary portfolios in the large, growing and on-trend frozen foods category, positioning the combined company to accelerate innovation and benefit from long-term tailwinds. 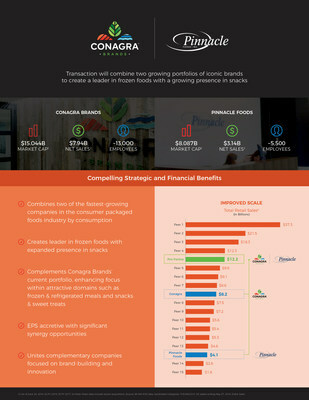 Compelling Growth Profile: Conagra Brands and Pinnacle Foods are two of the fastest-growing companies in the consumer packaged foods industry by consumption, and Conagra Brands expects continued momentum based on the enhanced scale and new opportunities to partner with customers that the transaction will provide. EPS Accretive: On a percentage basis, Conagra Brands expects the transaction to be low single-digit accretive to adjusted EPS in the fiscal year ended May 2020 and high single-digit accretive to adjusted EPS in the fiscal year ended May 2022. Significant Synergy Opportunities: Conagra Brands expects to achieve approximately $215 million in annual run-rate cost synergies by the end of fiscal year 2022, with one-time cash costs to achieve the synergies estimated at approximately $355 million, inclusive of expected capital expenditures of approximately $150 million. Financing Maintains Solid Investment Grade Credit Rating and Dividend Rate: The transaction is expected to be financed by Conagra Brands equity issued to Pinnacle Foods shareholders, new transaction debt and incremental cash proceeds from a public equity offering and/or divestitures. Proven Integration Capabilities: In recent years, Conagra Brands has established a proven track record of executing strategic transactions. The two organizations share complementary portfolios, supply chains, and results-oriented cultures, which are expected to facilitate integration. Under the terms of the agreement, each share of Pinnacle Foods common stock will be converted into the right to receive $43.11 per share in cash and 0.6494 shares of Conagra Brands common stock. Conagra Brands has secured $9.0 billion in fully committed bridge financing from affiliates of Goldman Sachs Group, Inc. ("Goldman Sachs"). The $10.9 billion purchase price is expected to be financed with $3.0 billion of Conagra Brands equity issued to Pinnacle Foods shareholders and $7.9 billion in cash consideration funded with $7.3 billion of transaction debt and approximately $600 million of incremental cash proceeds from a public equity offering and/or divestitures. On a pro forma basis, Pinnacle Foods shareholders are expected to own approximately 16% of the combined company, assuming issuance of the incremental equity to the public. Following the transaction, Conagra Brands' pro forma net debt-to-EBITDA ratio is expected to be approximately 5.0x. Conagra Brands is committed to maintaining a solid investment grade credit rating and targeting a debt-to-EBITDA ratio of 3.5x. Conagra Brands intends to maintain its quarterly dividend at the current annual rate of $0.85 per share during fiscal 2019. In the future, it expects modest dividend increases while it focuses on deleveraging, subject to the approval of its board of directors. The company also plans to repurchase shares under its authorized program only at times and in amounts as is consistent with the prioritization of achieving its leverage targets. Pinnacle Foods will continue to pay its quarterly dividend at the current annual rate of $1.30 per share until the transaction is completed. The transaction is expected to close by the end of calendar 2018, subject to the approval of Pinnacle Foods shareholders, the receipt of regulatory approvals and other customary closing conditions. Goldman Sachs and Centerview Partners are acting as financial advisors to Conagra Brands, and Jones Day is acting as its legal advisor. Evercore and Credit Suisse are acting as financial advisors to Pinnacle Foods and Cravath Swaine & Moore LLP is acting as its legal advisor. Morgan Stanley and Rothschild & Co. provided strategic advice to Pinnacle Foods. Conagra Brands will host a webcast and conference call at 9:30 AM Eastern Time today to discuss the transaction as well as its fourth quarter and full year Fiscal 2018 results, which were announced separately today. The conference call has been rescheduled to today from its originally-scheduled date of Thursday, June 28. The live audio webcast and presentation slides will be available on conagrabrands.com/investor-relations under Events & Presentations. The conference call may be accessed by dialing 1-877-883-0383 for participants in the continental U.S. and 1-412-902-6506 for all other participants and using passcode 8320318. Please dial-in 10 to 15 minutes prior to the call start time. Following the Company's remarks, the conference call will include a question-and-answer session with the investment community. A replay of the webcast will be available on conagrabrands.com/investor-relations under Events & Presentations until June 27, 2019. Additional information about the transaction can also be found at www.conagraandpinnacle.transactionannouncement.com. Conagra Brands, Inc. (NYSE: CAG), headquartered in Chicago, is one of North America's leading branded food companies. Guided by an entrepreneurial spirit, Conagra Brands combines a rich heritage of making great food with a sharpened focus on innovation. The company's portfolio is evolving to satisfy people's changing food preferences. Conagra's iconic brands, such as Marie Callender's®, Reddi-wip®, Hunt's®, Healthy Choice®, Slim Jim® and Orville Redenbacher's®, as well as emerging brands, including Alexia®, Blake's®, Frontera®, Duke's® and Angie's® BOOMCHICKAPOP®, offer choices for every occasion. For more information, visit www.conagrabrands.com. Pinnacle Foods Inc. (NYSE: PF) is a leading manufacturer, marketer and distributor of high-quality branded food products with a mission of unleashing brand potential. With annual sales in excess of $3 billion, our portfolio includes well-known brands competing in frozen, refrigerated and shelf-stable formats, such as Birds Eye, Birds Eye Voila!, Duncan Hines, Earth Balance, EVOL, Gardein, Glutino, Hungry-Man, Log Cabin, Udi's, Vlasic, and Wish-Bone, along with many others. The company is headquartered in Parsippany, NJ and has nearly 5,500 employees across the U.S. and Canada. For more information, please visit www.pinnaclefoods.com. This document contains forward-looking statements within the meaning of the federal securities laws. These forward-looking statements are based on management's current expectations and are subject to uncertainty and changes in circumstances. Readers of this document should understand that these statements are not guarantees of performance or results. Many factors could affect our actual financial results and cause them to vary materially from the expectations contained in the forward-looking statements, including those set forth in this document. 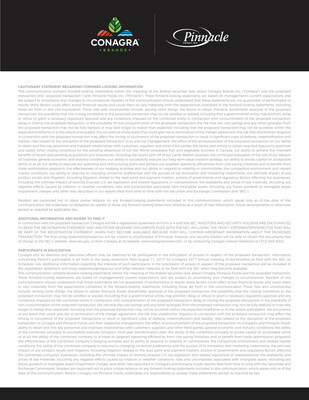 These risks and uncertainties include, among other things: the failure to obtain Pinnacle Foods shareholder approval of the proposed transaction; the possibility that the closing conditions to the proposed transaction may not be satisfied or waived, including that a governmental entity may prohibit, delay or refuse to grant a necessary regulatory approval and any conditions imposed on the combined entity in connection with consummation of the proposed transaction; delay in closing the proposed transaction or the possibility of non-consummation of the proposed transaction; the risk that the cost savings and any other synergies from the proposed transaction may not be fully realized or may take longer to realize than expected, including that the proposed transaction may not be accretive within the expected timeframe or to the extent anticipated; the occurrence of any event that could give rise to termination of the merger agreement; the risk that shareholder litigation in connection with the proposed transaction may affect the timing or occurrence of the proposed transaction or result in significant costs of defense, indemnification and liability; risks related to the disruption of the proposed transaction to us and our management; the effect of the announcement of the proposed transaction on our ability to retain and hire key personnel and maintain relationships with customers, suppliers and other third parties; the ability and timing to obtain required regulatory approvals and satisfy other closing conditions for the pending divestiture of our Del Monte processed fruit and vegetable business in Canada; our ability to achieve the intended benefits of recent and pending acquisitions and divestitures, including the recent spin-off of our Lamb Weston business; the continued evaluation of the role of our Wesson oil business; general economic and industry conditions; our ability to successfully execute our long-term value creation strategy; our ability to access capital on acceptable terms or at all; our ability to execute our operating and restructuring plans and achieve our targeted operating efficiencies from cost-saving initiatives and to benefit from trade optimization programs; the effectiveness of our hedging activities and our ability to respond to volatility in commodities; the competitive environment and related market conditions; our ability to respond to changing consumer preferences and the success of our innovation and marketing investments; the ultimate impact of any product recalls and litigation, including litigation related to the lead paint and pigment matters; actions of governments and regulatory factors affecting our businesses, including the ultimate impact of recently enacted U.S tax legislation and related regulations or interpretations; the availability and prices of raw materials, including any negative effects caused by inflation or weather conditions; risks and uncertainties associated with intangible assets, including any future goodwill or intangible assets impairment charges; the costs, disruption, and diversion of management's attention associated with campaigns commenced by activist investors; and other risks described in our reports filed from time to time with the Securities and Exchange Commission. We caution readers not to place undue reliance on any forward-looking statements included in this document, which speak only as of the date of this document. We undertake no responsibility to update these statements, except as required by law. This document includes certain non-GAAP financial measures, including adjusted diluted EPS from continuing operations, organic net sales, adjusted gross profit, adjusted operating profit, adjusted gross margin, and adjusted operating margin. Management considers GAAP financial measures as well as such non-GAAP financial information in its evaluation of the Company's financial statements and believes these non-GAAP measures provide useful supplemental information to assess the Company's operating performance and financial position. These measures should be viewed in addition to, and not in lieu of, the Company's diluted earnings per share, operating performance and financial measures as calculated in accordance with GAAP. Certain of these non-GAAP measures, such as organic net sales, adjusted operating margin, and adjusted diluted EPS from continuing operations, are forward-looking. Historically, the Company has excluded the impact of certain items impacting comparability, such as, but not limited to, restructuring expenses, the impact of the extinguishment of debt, the impact of foreign exchange, the impact of acquisitions and divestitures, hedging gains and losses, impairment charges, the impact of legacy legal contingencies, and the impact of unusual tax items, from the non-GAAP financial measures it presents. Reconciliations of these forward-looking non-GAAP financial measures to the most directly comparable GAAP financial measures are not provided because the Company is unable to provide such reconciliations without unreasonable effort, due to the uncertainty and inherent difficulty of predicting the occurrence and the financial impact of such items impacting comparability and the periods in which such items may be recognized. For the same reasons, the Company is unable to address the probable significance of the unavailable information, which could be material to future results. Hedge gains and losses are generally aggregated, and net amounts are reclassified from unallocated corporate expense to the operating segments when the underlying commodity or foreign currency being hedged is expensed in segment cost of goods sold. The Company identifies these amounts as items that impact comparability within the discussion of unallocated Corporate results. In connection with the proposed transaction, Conagra Brands will file a registration statement on Form S-4 with the SEC. INVESTORS AND SECURITY HOLDERS ARE ENCOURAGED TO READ THE REGISTRATION STATEMENT AND ANY OTHER RELEVANT DOCUMENTS FILED WITH THE SEC, INCLUDING THE PROXY STATEMENT/PROSPECTUS THAT WILL BE PART OF THE REGISTRATION STATEMENT, WHEN THEY BECOME AVAILABLE, BECAUSE THEY WILL CONTAIN IMPORTANT INFORMATION ABOUT THE PROPOSED TRANSACTION. The final proxy statement/prospectus will be mailed to stockholders of Pinnacle Foods. Investors and security holders will be able to obtain the documents free of charge at the SEC's website, www.sec.gov, from Pinnacle Foods at its website, www.pinnaclefoods.com, or by contacting the Pinnacle Foods Investor Relations department at 1-973-541-8629, or from Conagra Brands at its website, www.conagrabrands.com, or by contacting the Conagra Brands Investor Relations department at 1-312-549-5002. Conagra Brands and Pinnacle Foods and their respective directors and executive officers may be deemed to be participants in the solicitation of proxies in respect of the proposed transaction. Information concerning Conagra Brands' participants is set forth in the proxy statement, filed August 11, 2017, for Conagra Brands' 2017 annual meeting of stockholders as filed with the SEC on Schedule 14A. Information concerning Pinnacle Foods' participants is set forth in the proxy statement, filed April 20, 2018, for Pinnacle Foods' 2018 annual meeting of stockholders as filed with the SEC on Schedule 14A. Additional information regarding the interests of such participants in the solicitation of proxies in respect of the proposed transaction will be included in the registration statement and proxy statement/prospectus and other relevant materials to be filed with the SEC when they become available.